Slick’s, Chattanooga TN – Marie, Let's Eat! My favorite burger in town is at Zarzour’s, and Marie’s is at Sofa King. But there are other great ones in Chattanooga as well. Marie writes about another contender. 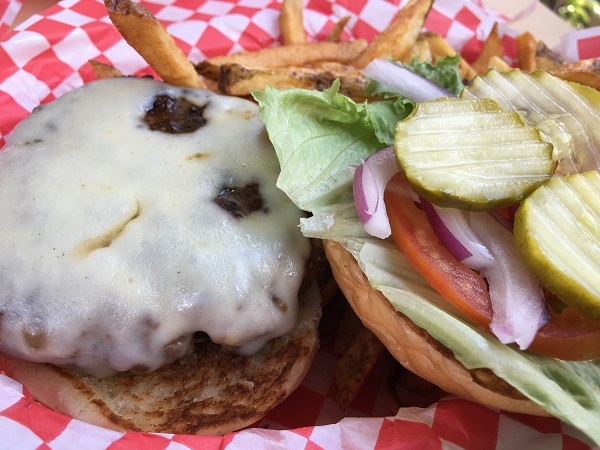 As our regular readers know, we have been pleased with Chattanooga’s burgers. There are a lot of choices, many of them stellar. 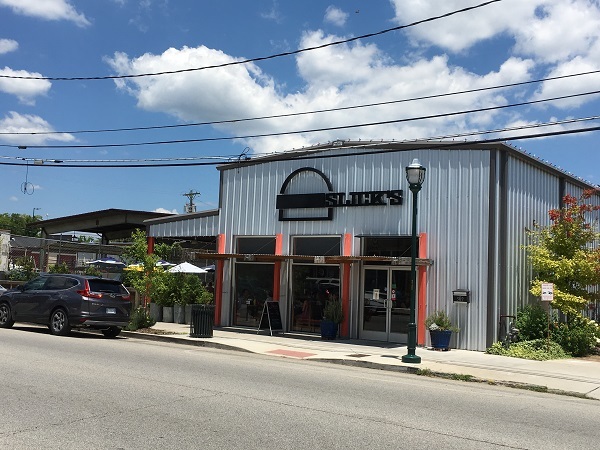 Our latest visit was to Slick’s, a cute little joint that has been in the Southside area since 2015. Before that it was in St. Elmo’s since 2013. We went on a Sunday afternoon, arriving just in time to get in ahead of a fairly long line of people; good timing on our part. It has a decent amount of seating inside and also has a good-sized patio with shade (essential if it’s even a little warm). There is a small outside stage and they sometimes host of events or acts in that space. We ate outside and it was quite pleasant. Our 6-year-old was fascinated by the plants potted in trash cans which served as part of the barrier between patio and sidewalk, so a good bit of our meal was taken up with a discussion of what constituted a proper container for plants. 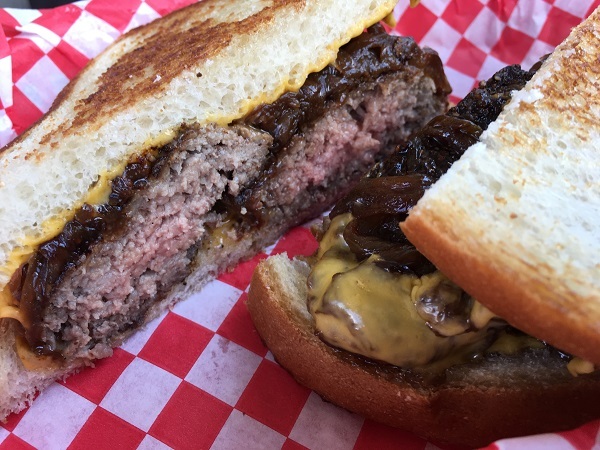 I got the patty melt but chose to take it with the smaller size patties-good thing, too, because it was a bit on large side for me. I’d expect you have to bring a pretty good appetite to eat the regular patty melt. It was a bit unusual though in that the patties were thick and next to each other on the bread instead of thin and one on top of the other. The onions were really well caramelized, and the burger was quite juicy. Slick’s uses Niedlov’s bread, as many of the better burger joints (and other restaurants) around here do. The hand cut their fries rather than getting them off a truck frozen, and boast of making all their sauces, dressings, etc. from scratch. Overall it was tasty and a good experience. It won’t dethrone Sofa King in my affections, at least until such time as I’ve sampled a peanut butter burger for a fair comparison, but we left pleased with our lunch. Posted on August 22, 2017 by Grant G.Posted in burgers, chattanooga, marie writes, tennesseeTagged burgers, chattanooga, marie writes, tennessee.